1. Left Half of Oval: In addition to forming the first half of the "O," it also serves as the letter "C," which represents company patriarch Carlos Fuente Sr.
2. Orange Glow: Nickel mines in the mountains of Bonao radiate an amber light that can be seen at night from the Chateau de la Fuente tobacco farm. 3. 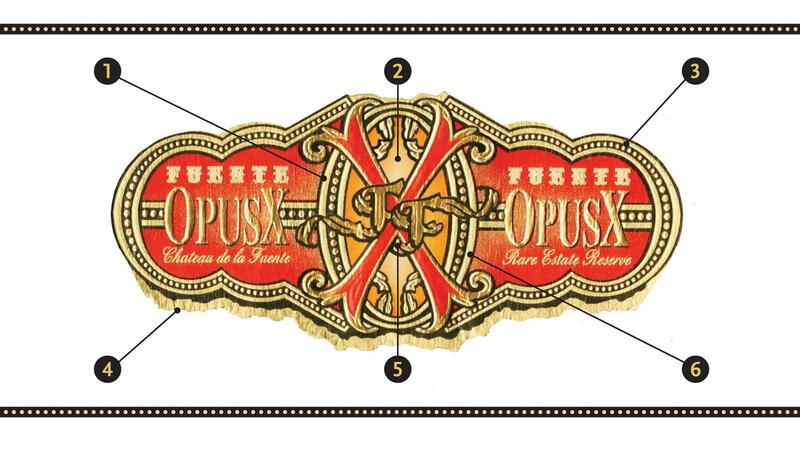 Die-Cut Style: The die-cut shape of the band is the same geometric pattern of most Arturo Fuente cigar bands, from the Don Carlos to the flagship Gran Reserva. 4. Torn Edge: An allusion to Fuente Jr.'s childhood. As a boy, he tore a valentine down the middle, giving the first half to his sweetheart and keeping the other. 5. Double F: The bond between father and son is central to the monogram. A pair of gilded "Fs" symbolizes both Fuentes—Carlos Fuente Sr. and Carlos "Carlito" Fuente Jr.
6. Right Half of Oval: In addition to forming the second half of the "O," it also serves as the letter "C," which represents company president Carlos "Carlito" Fuente Jr.